Melbourne's most trusted debt collection and recovery agency. With over 15 years' experience, our business depends on successful collection. 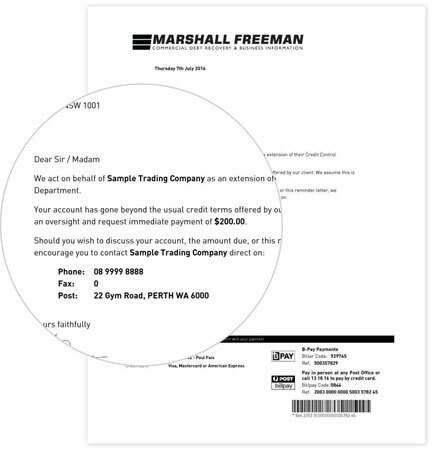 Marshall Freeman Collections is Melbourne's leading debt collection agency, providing businesses with cost-effective and results driven debt collection solutions. With a focus on delivering results, it's one of many reasons why over 20,000 businesses in Melbourne, Geelong, Ballarat and regional Victoria trust us with their debt collection. With over 15 years' experience, our professional team of collection specialists know what it takes to get your debt paid quickly through leveraging the latest technology and collection techniques. Offering both personal and commercial debt collection services, we are able to quickly identify a willingness and ability to pay to get your debt settled faster. We deliver a stress free, ethical and efficient recovery process that's based on the foundations of making sure your overdue is a priority. If you're looking for a results driven debt collection solution, please get in touch as we recover debts most other collection agencies write off.